My favorite time of year is finally here. Yes, I love every single thing about the holiday season. Most of all I love all of the yummy food and treats. 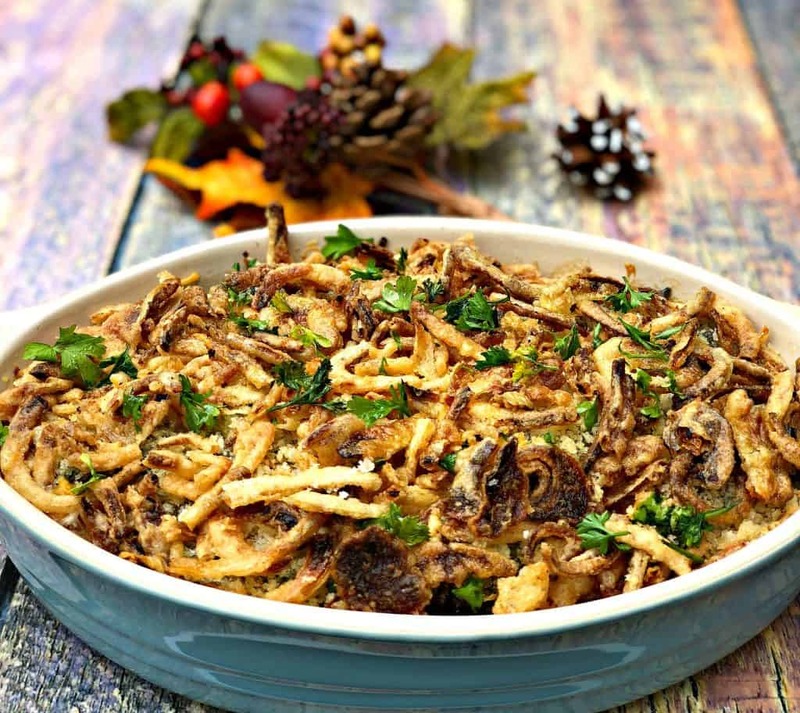 This green bean casserole recipe is not just for the holidays. This dish is so scrumptious you will likely want to eat it any time of the year. Why did I use an Instant Pot? Well because I wanted to. Surely, you can make green bean casserole without an Instant Pot. Just like you make a ton of other recipes without an Instant Pot. I love using my Instant Pot because it is convenient for me and my lifestyle. Pressure cookers also do a great job of producing immense flavor. A lot of my fellow Instant Pot fans will agree with me there. I like being able to set something to cook and then walk away. The experience is different than a slow-cooker because I don’t have to wait several hours for the meal to complete. I can maybe do a load of laundry and come back or cook other side dishes or meals in the meantime. These perks come in really handy for holidays like Thanksgiving and Christmas. I am usually responsible for a few different menu items for our family holiday celebrations. Cooking could very well turn out to be an all day event for several different reasons, varying oven temperatures required for baked items, the time it takes to properly prep certain dishes, etc. Having a stand-alone appliance can help out a lot. 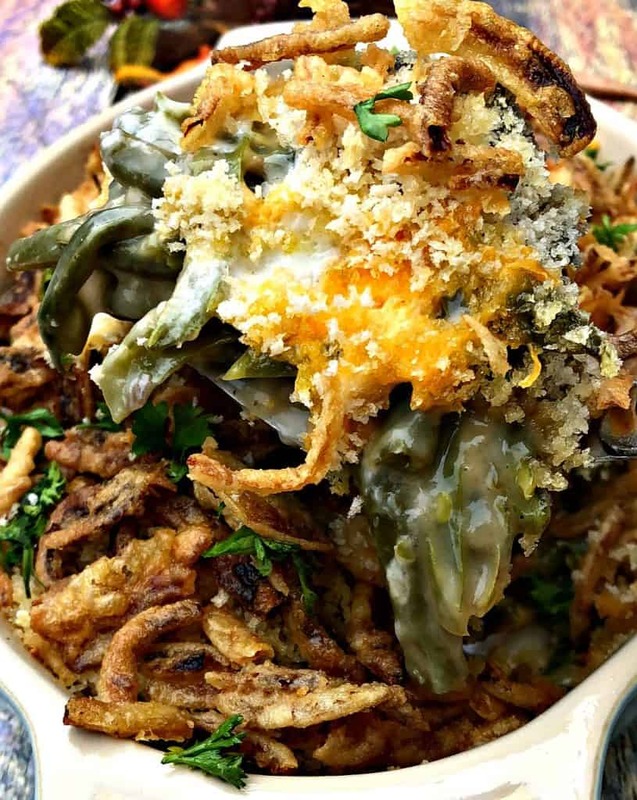 This green bean casserole may be a little different than what you are used to. I added shredded cheese. I couldn’t resist! If you are dairy-free or vegan, simply omit the ingredient. The casserole is still such an amazing side dish. I love to remix my favorite childhood recipes from time to time. See recipe card below for stovetop instructions in addition to the Instant Pot instructions. 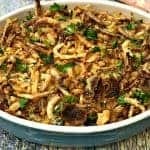 Instant Pot Green Bean Casserole with Cheese is a quick and easy pressure cooker recipe with fried onions, cream of mushroom soup and cheesy goodness. I didn't add any water or broth to the Instant Pot for the green beans. The soup was enough for me. If you wish you can add a cup of water or broth and drain it before baking. Place the Instant Pot on the Sauté function. Add the olive oil and garlic. Cook until the garlic becomes fragrant. Add the cream of mushroom soup and green beans to the pot. Add salt and pepper to taste. Close the pot and seal. Cook in Manual High-Pressure Cooking for 15 minutes. When the Instant Pot indicates it has finished, quick release the steam. Turn the Instant Pot to the sauté function. Combine the flour and water in a small bowl to create a slurry. Add the slurry to the pot. Add half of the shredded cheese and stir. Cook for a couple of minutes until the cheese has melted. Place the mozzarella cubes throughout the casserole. Top with the remaining shredded cheese, panko breadcrumbs, and fried onions. Serve. Remove the green bean casserole from the pot after adding the flour water slurry and half of the shredded cheese. Spray a baking dish with cooking spray. Transfer the casserole to a baking dish. Place the mozzarella cubes throughout the casserole. Top with the remaining cheese, breadcrumbs and fried onions. Bake for 5-7 minutes until the cheese has melted and crisped slightly on top. Add the garlic to a large pot over medium-high heat. Cook until fragrant. Add the soup, green beans, and salt and pepper. Cook until the green beans are soft for 4-5 minutes. Add half of the cheese and stir. Spray a baking dish with cooking spray. Transfer the mixture to a baking dish. Place the mozzarella cubes throughout the casserole. Top with the remaining cheese, and breadcrumbs. Remove the dish. Top with the french fried onions. Bake for an additional 5 minutes. I purchase blocks of cheese and do the grating and shredding on my own. The cheese melts a lot better this way, vs purchasing pre-shredded cheese. It looks great – but I have one question – can a pressure cooker be used for this recipe? Yes, an Instant Pot is a pressure cooker brand. Now that looks like a perfect one pot meal. I love green beans and this looks loaded with the good stuff. Love it when its cheesy. yum! I love crunchy fried onions! I own an Instant pot but haven’t used it yet. I’ve never tried anything like this before, looks yummy though! 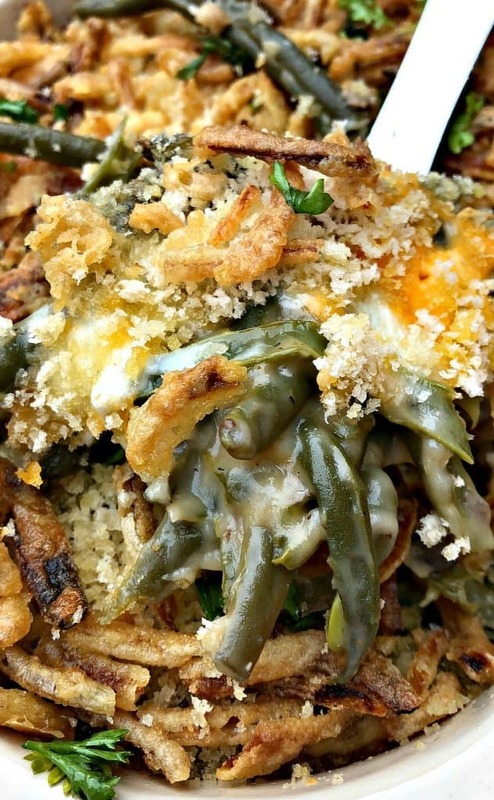 I feel like green bean casserole gets such a bad rap, but I love it. I’ve never made it in the Instant Pot before! Wow, this recipe looks amazing! 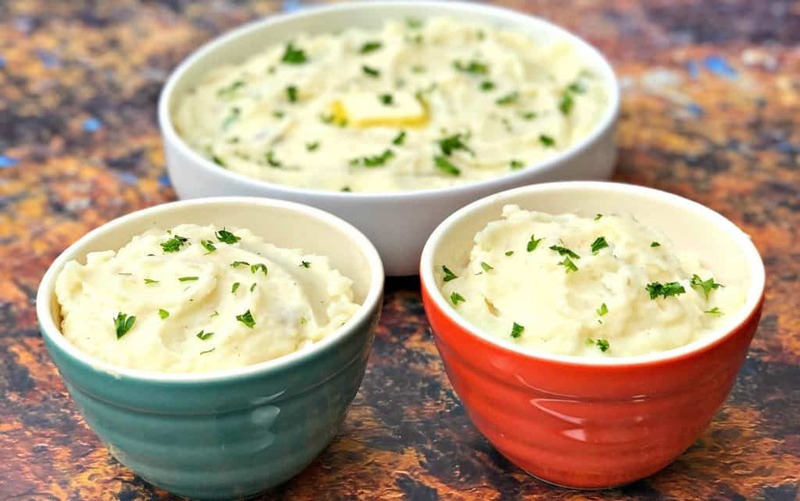 Move over other side dishes this Thanksgiving! This one will be the star of the show! This looks amazing! This would be the perfect addition to my Thanksgiving spread or just any night of the week. Yummy! I’ve never put together green beans and cheese before! That’s all too interesting for me and that’s why I would love to give this recipe a try! It looks really good. I wish I had an instant pot, it makes this Thanksgiving classic look so easy! This green bean casserole is perfect side dish for a good roast. Great idea for this time of festivities, the instant pot makes it easy. I’m marveling at green bean casserole in an instant pot! Is there anything that appliance can’t do?! Awesome! I bet this handles the fresh green beans perfectly. The texture must be perfect. This looks a amazing! I have an instant pot, but have not used it yet…pinned this to try!! 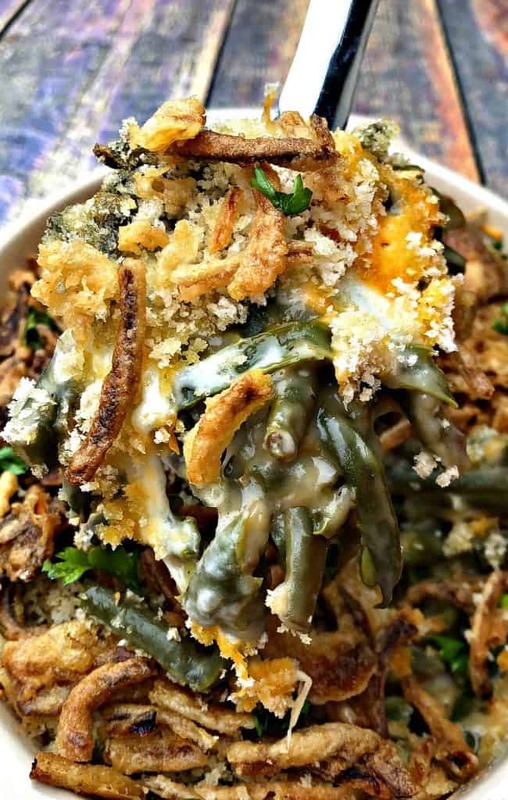 Wow, this looks really yummy — this instant pot green bean casserole looks good! I have an instant pot and I am going to give this a try – for Thanksgiving! Hmm that looks delicious. Easy recipe. Love the preparations. And my mom will love this. Wonderful. I hope that you enjoy. Ooo this looks absolutely delicious! Perfect for a weeknight meal. Saving! This dish looks so delicious. I totally love meals with cheese in it. This dish is a long time family favorite. It’s always requested for holiday meals. This is totally making my mouth water! Anything covered in cheese gets an A+ in my books! I’m going to have to try to make this one day, maybe even this weekend. INstant pot said burn before it was able come to Pressure. Interesting. I have never seen my Instant Pot display “burn.” Did you use the exact servings and ingredients per the recipe? My daughter absolutely loves green beans! She’d probably go nuts for this dish! She would love it then! I know this is cheating, but can I use can green beans? You can, but cut down the cook time. I would try 5 minutes. Do you think I can sub cream of chicken for the cream of mushroom? I assume that you use a can of undiluted condensed cream of mushroom soup, correct? Your directions say add the soup. Correct. You don’t need to dilute the soup.